On the north side of the forecourt.Access available during normal working hours. In the centre of the forecourt. A white Portland limestone obelisk comprising a three-stepped octagonal base, a canted plinth and a square pedestal surmounted by the obelisk which is supported on four balls. 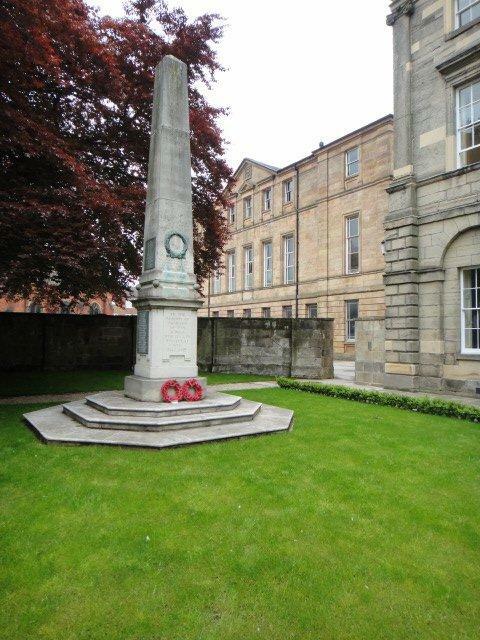 The WW1 commemoration is incised in a raised panel on the 6 o'clock face of the pedestal and the names are incised on three green slate tablets on the other three faces of the pedestal. The WW2 commemoration is incised on the 6 o'clock face of the obelisk and the names are incised on three green slate tablets on the other three faces of the obelisk. A cast bronze victors' laurel wreath is attached to the 6 o'clock face of the obelisk. Inscriptions are in upright capital roman lettering, those on the tablets coloured white. 2013: site has been re-occupied by an Accounting firm. October 2012: Building under renovation and area surrounding memorial landscaped. Leasing agreement made for building to be used as commercial offices by local company. April 2012: A high brick wall was built around the perimeter of the courtyard. The memorial is no longer accessible or visible from the public road. c2005: The adjacent Grade I Listed St Helen's House had become dangerous, was closed, fenced off, and proposed for refurbishment. 19 April 2001: Memorial listed Grade II, Heritage List for England reference 1246236. c1990s: Adjacent building registered on Derby City Council's List of Buildings of Local Interest. 1993: The memorial was relocated to a site close to its original position at St Helen's House. 1988: Name of school changed to Moorway Community School. Relocation of memorial under consideration. 1974: The school was changed from a grammar school to comprehensive school. 1966: Derby School moved to new building at Littleover, with the memorial being moved to the new site. 20 June 1952: Adjacent building listed as Grade I with English Heritage reference of 402860. Published:Derby City Council A list of locally important structures listed by the City council for conservation purposes. Derby Daily Telegraph 3/ 12 December 1921 Extensive report on the unveiling ceremony. Nottingham Evening Post 4/ 11 November 1921 Report on unveiling ceremony. Derby Daily Telegraph 2/ 10 November 1921 Announcement regarding imminent unveiling.